I recently “rediscovered” a wonderful local venue for science here in So Cal – the Huntington Library in beautiful San Marino. The Huntington library is a very elegant location that includes a vast botanical garden, tea house, art gallery and some pretty amazing free evening lectures. I remember attending some lectures there in the past, and the other night I was reminded just how much I used to enjoy visiting the Huntington Library for an evening of science. The Huntington Library is only about a mile from the Caltech campus in Pasadena. The lecture I attended was called “Tiny but Powerful” and was presented by Carnegie-Princeton Fellow Jenny Greene. The talk was an insightful overview of Dr. Greene’s research into locating the smallest supermassive black holes – on the order of 100,000 solar masses, puny by the standards of the black holes lurking in the center of galaxies. The lecture was very well attended, and afterward Greene was swamped with all sorts of questions by black hole enthusiasts including some very bright kids. Next week’s lecture, on April 19, is going to be one of a kind. Famed astronomer, Vera Rubin (see inset photos) will be giving a talk on dark matter. In case you don’t know, Dr. Rubin first stated the Galactic Rotation Problem that questioned the discrepancy between predicted and observed galaxy rotation curves. Rubin’s work led to the theory of dark matter which arguably remains one of biggest mysteries of the universe. 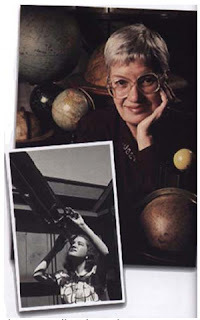 Vera Rubin, 82, is an icon in the field of astronomy and I am very much looking forward to this unique opportunity to hear her views on the cosmos. I would recommend checking out the Huntington Library calendar of public events to find out about other intriguing science lectures. Thanks Daniel, it was a great lecture tonite!! Had a great time. I took my son with me and he loved it. recommend? will there be more at the huntington? how much science and math do you have to know to go? Alas, the science lecture season is over at the Huntington after 4 excellent talks in this year's series. Look for next year's lecture series when I comes out, you won't be disappointed at the quality you'll witness. You might Google "So Cal Science Cafe" for a great group that alerts members to lectures all over So Cal. Happy science!